If you want to pull your hair out, click on this link. It was an ESPN article from three years ago. 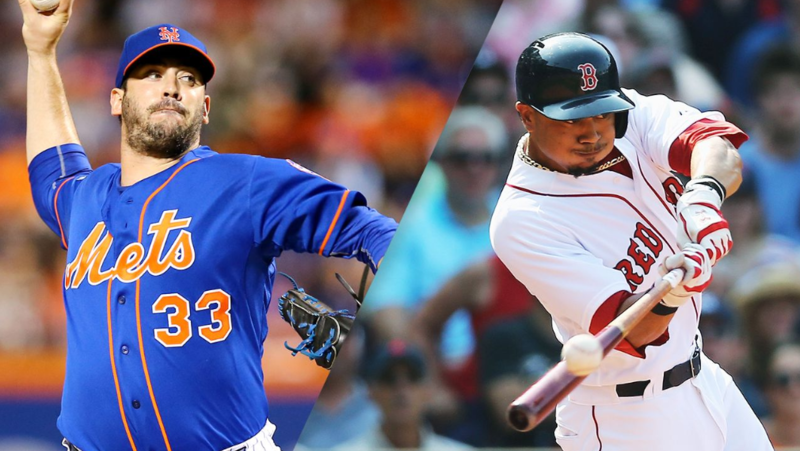 At the time, there were rumors that the Mets would trade All Star pitcher Matt Harvey for a young Red Sox outfielder named Mookie Betts. I will now take this opportunity to come clean. Like many other Mets fans, I was vehemently opposed to this trade. Matt Harvey was the 2015 comeback player of the year. He defeated both Dodgers and Cubs in the playoffs and famously pitched his heart out in game 5 of the World Series. I was one of the fans who was happy to see Collins give Harvey a shot in the ninth inning. The idea of trading our ace just days after the World Series was too much to handle… but I was wrong. Mookie Betts was an up and coming star after 2015. In his first full season, he slashed .291/.341/.479 while hitting 18 home runs and driving in 77 runs. He put up a WAR of 5.9 and was years away from free agency. There was no question that he was good. The only question was how good. Was it worth giving up an ace for a very good everyday player? Every player has the same output. Every player involved has the same health situation. For starters, the Harvey saga would have been avoided. This means that all the drama involving his ineffective pitching, late night partying and bad attitude would have been moved to Boston. The back pages of the New York tabloids would have been less entertaining. Had the Mets not kept Cespedes, would Murphy have stayed in New York? Yoenis Cespedes would have left NY following 2015. The 2016 outfield from right to left would have been Granderson, Betts and Conforto. Lagares would have been the extra outfielder. That means that the Mets wouldn’t have given Cesp big time cash following 2015. More importantly, Cespedes wouldn’t have opted out and returned after 2016. The Mets would have gotten a front-line starter to replace Harvey. It is unlikely the Mets would have broken the bank for Price or Greinke. However, it is possible that they would have gotten someone like Cueto, Zimmermann or Samardzija. Based on what they paid Cespedes, I think that Alderson would have landed Johnny Cueto. The Mets would have kept Daniel Murphy. After 2015, the choice was between Cesp and Murph. Without Cesp in the picture, it is very probable that the Mets keep the NLCS MVP and not gotten Neil Walker. Would a Harvey trade resulted in the Mets signing Cueto? What would have been the impact for 2016? The 2016 Mets would have likely won the division. Each player involved makes this a no brainer that the Mets end up ahead. The Mets would likely have won just under 100 games. Being that many of those loses were to the Nationals and Daniel Murphy in particular, it is fair to assume that the Mets would have had a strong lead by the end. With that said, the Mets did have a number of injuries to key pitchers like deGrom and Matz by the end of the season. This is why I doubt they would have returned to the World Series. The hypothetical 2017 Mets would have been a bit better that the real one, but not enough to be relevant. While Betts and Murphy would have been better than Cespedes and Walker, the 2017 squad was crippled with injuries. Cueto missed a fair number of starts that year, so he would have fit right in. The Mets wouldn’t have lost 92 games, but I don’t think that would have broken the .500 mark. Harvey also was a net loss, but Cueto was inconsistent in 2017 and the Mets would have probably had around 76-78 wins. 2018 is a bit harder to project. Betts was an MVP, but Murphy was injured and not much of a factor. While Harvey was terrible in his minimal starts, he left before he could cause too much damage. The 2018 team would probably have been several games over .500, but it is wouldn’t compete seriously for the wild card. My guess is that the Mets would have ended up with around 83-84 wins and fallen short of the playoffs. There are other questions marks that are hard to predict. Had Murphy been in Flushing in 2016, would TJ Rivera or Jeff McNeil have been called up? I assume that Vargas wouldn’t be a Met today had they signed a starter after 2015 but it is hard to predict. Terry Collins likely would still be the manager and perhaps Alderson would have only temporarily stepped aside until he got healthier. Also, without all that money owed to Cespedes, who knows what other moves may have been made. Had the Betts for Harvey trade gone through, what would have happened to the Red Sox? For starters, they would have needed a big bat to replace Betts. Being that Boston is never bashful with cash, they likely would have gotten one of three stars. Jason Heyward and Justin Upton were both prized players prior to that season. The third one was… you guessed it… Cespedes. In a stranger twist of fate, the 2016 Sox could have included Cespedes. Now it is hard to say for sure that they would have wanted him back. However, after 2015 Cespedes was a coveted possession. Had Matt Harvey gone to Boston, it is doubtful that they would have been as patient as the Mets. While Harvey would have been given a shot after 2016, it is unlikely that the Red Sox would have had him pitch much in 2017. At the same time, the biggest impact of getting Harvey could have been that the Red Sox may not have signed David Price. In terms of team results the Red Sox would still have been good, albeit not great without Betts. True, they likely would have made other moves, but it is hard to imagine they would have won the last three division titles. Without going into too many details, I think they would have been a wild card team in 2016 and 2017 but wouldn’t have gone far in October. Were the 2018 Red Sox good enough to win without Betts? The really tough question is 2018. While the Red Sox wouldn’t have won 108 games, they had such a great team that they would have still won over 100. My prediction is that the Red Sox would have won the division and the World Series. Betts wasn’t a big factor in the postseason, so any replacement player would have done a similar job. To conclude, this is all hypothetical. It is fun to play the ‘what if’ game sometimes. Had the Mets made that trade, they’d be in much better shape right now. The hardest part for me is that had the 2016 Mets had Betts, Murphy and Cueto, they could have won it all. Sadly, we will never know.